If you love to cook, a great kitchen can make a huge difference. At Mangrove Villa at Indigo Reef, there’s enough space for several cooks to work simultaneously, along with custom hardwood cabinetry, double ovens, a large refrigerator with ice maker, wine cooler, dishwasher, and microwave. It’s not the flashiest villa, but it does offer life’s purest comforts: good food, time with loved ones, and Caribbean sunshine. Perfect for a large family or group of friends! 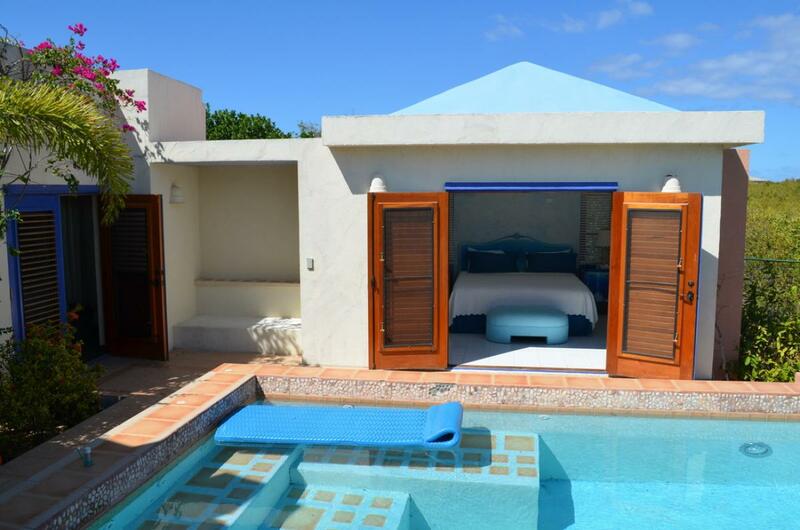 Mangrove Villa is a four-bedroom property in the Indigo Reef Resort on West End Bay. This villa is bordered by tropical, landscaped gardens and is just a 5-minute walk from the powder white sands of Shoal Bay West. Mangrove’s terraces offer ample space to sunbathe, read a book, or dine al fresco. The rooftop lounge is perfect for soaking up the afternoon sunshine or having sunset cocktails. The 50 x 20’ freeform pool has a mosaic-tiled waterfall feature and manicured gardens on three sides for privacy. This vacation rental also has its own Jacuzzi and a poolside sun deck. The veranda is furnished for both dining and lounging, with a long wooden dining table and couches facing the gardens. There’s also an outdoor gas grill for laidback barbecues. West End Bay is perfect for snorkeling or shelling, and unspoiled Shoal Bay West is only seven minutes away. Designed with entertaining and conversation in mind, the Great Room has three circular banquettes for lounging, dining, or watching TV. Mangrove’s gourmet kitchen is equipped for preparing simple meals or elaborate multi-course feasts. There is ample space for several cooks, custom hardwood cabinetry, double ovens, a large refrigerator with an ice maker, a wine cooler, a dishwasher, and a microwave. A 15’ mosaic bar, tempered glass tile countertops, and a butcher top island work area round out the Great Room. The four air-conditioned bedrooms all have access to a private patio, ensuite bathroom, and large closet. The bedrooms have memory foam beds with luxury linens and are designed with purple heart large plank floors. Three suites have a king bed and one has two double beds. The spacious ensuite bathrooms are artistically tiled with original handmade mosaic. Indigo Reef Resort has winding paths through vibrant tropical gardens that connect each villa to the communal pool, BBQ/party area, library, and game room. Mangrove Villa’s living and dining spaces, gourmet kitchen, spacious pool deck, and close proximity to several beaches and restaurants makes it a perfect vacation rental for large families or a group of friends. Upon arrival guests will secure a taxi and drive to the villa.